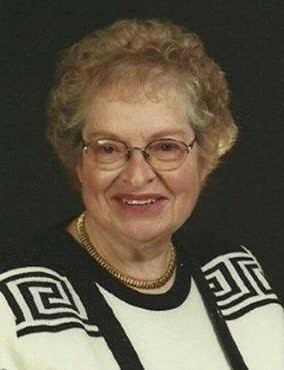 Obituary for Marjorie Needham Pickel | Longwood Funeral Home & Cremation of Matthew Genereux, Inc. Heaven gained a saint on November 16, 2018, with the entrance of Marjorie Pickel. She was married to her husband and best friend of 69 years, Calvin Pickel. She was born at the West Grove Hospital on September 12, 1932. Her parents were Bert and Blanche Needham. A 1950 graduate of Avon Grove High School, she began her career as a secretary to Frank Perna, Esq. She later became a teller at the Avondale Bank; which later led her to Vice-President of Southeast National Bank at her retirement. Marge went on to manage the Koinonia Christian Bookstore in Kennett Square. Marge was a member of Avondale Presbyterian Church, where she served since 1949. She was known as a faithful “prayer warrior” both at the church and among her friends. She was also a member of the YAG Club for 65 years. In addition to her husband, she leaves behind a sister Louise (Bob) Courtney, and three brothers, Donald (Judy) Needham, William (Sally) Needham and Jimmy (Bernice) Needham. In addition, she leaves behind many nieces, nephews, great-nieces and great-nephews. A viewing will be from 9:00 AM until 11:00 AM with a funeral service at 11:00 AM on Monday, November 26, 2018 at AVONDALE PRESBYTERIAN CHURCH, 420 Pennsylvania Ave., Avondale. Burial will follow the funeral service in Union Hill Cemetery, Kennett Square. In lieu of flowers, memorial donations may be made to: Salvation Army or American Bible Society. Family flowers arranged by leStyle25 of Unionville, 610-925-1901.